The Finger and the Moon Project started in 2006 with a preparatory research on the main religious beliefs and on the different ways of praying in the world. Liuba spoke with the Imam of a Mosque and went to pray with Muslim women; she talked about Jewish Religion and Prayer with the Rabbi of a Synagogue; she investigated the practice and the spirituality of Buddhism speaking with different people; she learned how to pray Zazen in a Zen Temple, she went to a Native Reserve in Quebec, Canada, to know more about Native American Spirituality. Performance outfit made in collaboration with stylist Elisabetta Bianchetti. The first step of this project was an interactive performance presented at the Opening of the 52 Venice Biennal on June 7 and 8, 2007. Dressed like a nun, but with a ‘multifaith’ special dress expressly conceived for this project, Liuba prayed simultaneously different kind of prayers of the main world’s Religions, previously deeply investigated. Liuba worked with italian stylist Elisabetta Bianchetti to conceive a special nun dress with multi-religious references details. Looking carefully to the details, the dress is different from the one used by real religious. It has also been designed taking inspiration from the Renaissance Madonnas. Liuba cameraman, Raymonda Gentile, was hidden to the public and recorded both the performance and people’s reactions to it. From the performance comes a two channel video installation, a series of photos and a video still strip. 2012 S.Agustin Museum, Genoa (I); Betta Frigieri Arte Contemporanea, 2009, Modena, Italy; Cem Mondialità, 2009, San Marino Republic; Séquence, 2009 Chicoutimi, Canada; Galerie Pascal Vanhoecke, 2009, Paris, France; Native Museum, 2009, Mashteuiatsh (Indian Riserve), Québec, Canada; Galleria Famiglia Margini, 2009, Milan; Placentia Arte, 2009, Piacenza, Italy; Galleria 12 -13, 2009, Rome; Archibishop Place 2009, Belem, Brasil; Il Giornale.CH, 2009, Zurich, Switzerland. 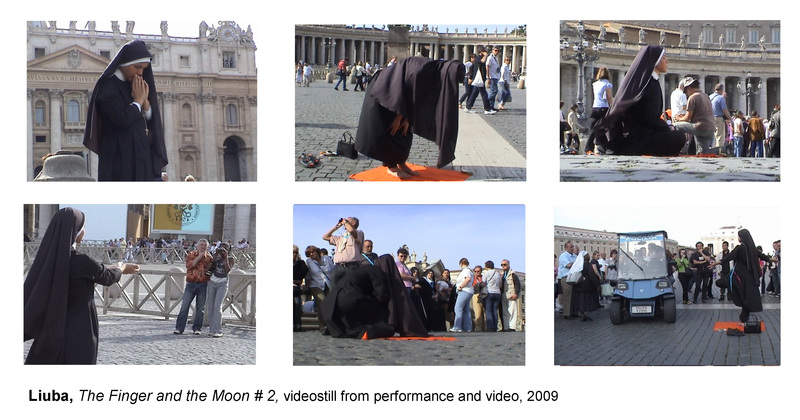 The second step of the project consisted in a urban interactive performance at St. Peter’s Square, Vatican City, on May 9, 2009 and in the live streaming of it seen simultaneously in different galleries and locations of the world. Liuba went to S.Peter’s Square dressed as a nun. Looking carefully to the details, the nun dress was different from the one used by real religious because of many multi-religious references details. As she arrived in the Square she began to pray in many different ways following the rituals of the world’s main religions and practices. People reactions to the performance were not homogeneous: they went from disinterest to surprise to appreciation to meditation to complaint. After more than 1 hour Police stopped the artist saying it was not allowed praying like this on Vatican Ground. Both for the symbolic value of the location and for the unpredictability of reactions, Liuba decided to show the performance live in streaming in different places of the world at the same time. 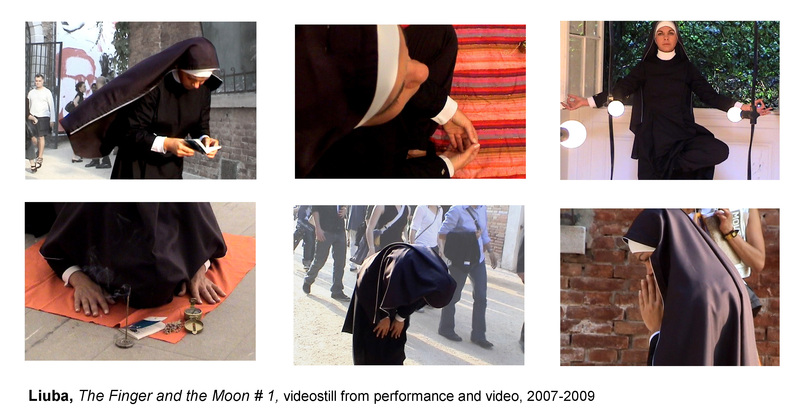 Using the possibility of advanced technologies, The Finger and the Moon #2 had been and exhibited with a live streaming in galleries, artists studios, collectors houses and religion communities in different part of the world, that in this way were symbolically connected together. The streaming had been seen only in ‘real and phisical locations’. People gathered in the galleries to watch the performance live in streaming while in the same moment Liuba was performing in Vatican City. There was a password, given only to the network locations, for getting connected to the streaming. The performance was recorded by two hidden cameraman: Barbara Fantini and Raymonda Gentile. Barbara shootings were seen live in streaming, while Raymonda’s ones were more focused on people reaction’s to the performance. From the performance comes a two channel video installation, a two channel integral streaming video, a series of lambda print dyptychs and a video still. 2014 Fünfseenfilmfestival, Bavaria (D); 2013 Flash Art Event, Milan (I); 2012 S. Agostino Museum, Genoa (I); 2011 “The Mystical self, Art Verona and Civic Public Library, Verona (I); 2011 3rd Ward, Brooklyn, NY (US); 2011 (.Box) Videart Project Space, Milan (I); 2011 “ Flashforward 3” (.Box) Videart Project Space, Milan (I); 2010 Diocesan Museum, Jesi (I); 2009 Betta Frigieri Arte Contemporanea, Modena, (I); 2009 Cem Mondialità, San Marino Republic; 2009 Séquence, Chicoutimi, Canada; 2009 Galerie Pascal Vanhoecke, Paris, France; 2009 Native Museum, Mashteuiatsh (Indian Riserve), Québec, Canada; 2009 Galleria Famiglia Margini, Milan; 2009 Placentia Arte, Piacenza (I); 2009 Galleria 12 -13, Rome; 2009 Archibishop Place Belem, Brasil; 2009 Il Giornale.CH, Zurich (CH). People of different faiths and beliefs took part in “Finger and the Moon 3”, meditating together with the artist, Liuba, in a collective performance. The event, curated by Alessandra Gagliano Candela, is preceded by almost a year of work, mapping the territory made by the artist and supported by anthropologist Barbara Caputo, who established a direct rapport with different religious communities in the area, directly involving the inhabitants of the city into the art project. The church of Sant Agostino, a container rich in history, lends itself particularly well to the realization of this performance/rite of great emotional and conceptual impact: a video-installation inside showed the videos of the two preceding stages of the project, while members of diverse religions prayed in the nave of the ancient religious building. Liuba was wearing a new piece of artwork/clothing- the fruit of her collaboration with stylist Elisabetta Bianchetti. The process of meeting and involving people in the performance is part of the piece and it’s documented by photos, videos and writings. We believe that art needs to go out of museums and galleries, and it must become an integral part of the fabric of our society. Twelve people of different faiths and beliefs participated with Liuba at the collective performance. There were Baha’i, Sikk, Muslims, Indu, Jewish, Christian, Atheist and Buddhist people. The event was of a strong impact. Participants met with Liuba in the Deconsacrated Church a few hours before the performance began. The artist explained the importance of everyone feeling well, relaxed and free during the performance; being part of a performance is not like acting in the theater, rather it is being natural and true. All the people involved were free to meditate and act in any way he or she liked, needing only to keep in mind simple logistical/spatial rules previously decided upon. Participants introduced themselves to the others, explaining their reasons for taking part in this important piece of performance art and symbolic faith sharing event. The collective performance began with all the participants on the steps of the church’s apse breathing in unison; respiration is a universal need that is common to all people, religious or otherwise. Then Liuba descended into the nave, moving among the public and praying various prayers of many religions. On her ad hoc oufit were images of several places of worship, temples and churches in New York City. The participants then descended, one by one, into the nave while meditating individually in their own, personal ways. There was music composed for the event by Liuba which mixes together some sacred music of various religions and video projections of the Finger and the Moon project videos #1 and #2. The performance ended with Liuba writing ‘The Finger and The Moon’ sentence on the floor of the church and then leaving the church and entering the real world and everyday life hand-in-hand with all the participants. Liuba (NET)) is the name chosen by the artist to maintain her identity as an artist and to underline and thank the network of people who collaborate, support, witness and contribute to her project, without which the work would not be possible. P. Alessio Saccardo, for his generous contribution which allowed us to to realize the project and to Daniele Cabri and Nadia Antoniazzi, Annalisa Cevenini, Cecilia Freschini, Francesca Agrati, Geneviève Saya Brillet, Michel Duchesneau for their support, not just economic. 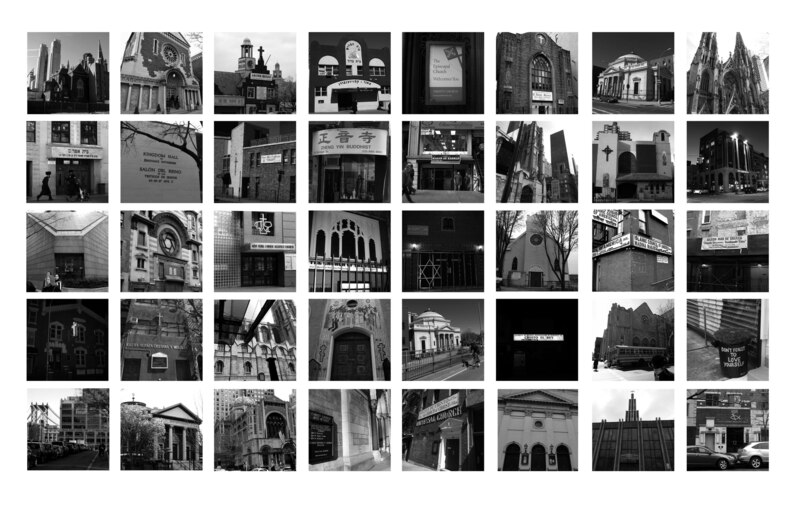 A series of photographs of different temples, churches and places of worship taken in New York by LIUBA in 2012. Those photos were used in the design of the artwork-robe worn by Liuba during the performance of The Finger and the Moon #3, and produced by the Italian fashion designer, Elisabetta Bianchetti, who specializes in religious clothing. A series of 7 polyptych montages, 2013. The series is inspired by the medieval altarpieces consisting of a main image and a predella below. 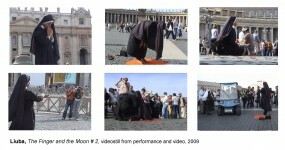 The montages are constructed from photographs and video stills taken from 3 different versions of The Finger and the Moon performed at different locations. Each montage is a work in its own right and opens up new conceptual, semantic and aesthetic perspectives on the overwhelming importance of religious diversity today.